Combining climate change and evolutionary and trait-based ecology to improve our understanding of underlying mechanisms in adaptations to environmental change. My research combines climate change, evolutionary and trait-based ecology to improve understanding of underlying mechanisms in adaptation of alpine plant communities to environmental change. I have documented local adaptations to the harsh alpine conditions but also decreased phenotypic plasticity at high elevation, and we find that this can have important implications for how populations tolerate environmental change. For example, range-edge populations at the limit of the species’ distribution performed badly under warmer climatic conditions, potentially due to costs of decreased phenotypic plasticity in the harsh environment (Delnevo et al. 2018, Davy 2018). This implies high sensitivity to climate change, especially at high elevation. Figure1: Plasticity in phenological development as the difference in onset of a phenological stage in days since SMT±2SE between treatment and origin-control plants. The x-axis represents the difference in SMT between origin and destination site. The different stages are bud, flower and fruit. The colours and symbols indicate the transplant treatments to: warmer (red triangle), wetter (blue circle) and warmer & wetter (purple square) climate. Points below/above the dashed grey line indicate earlier/later days since SMT for onset in a stage in the transplanted plants compared to the origin-control plants. Closed circles indicate a significant difference between treatment and origin-control plants. Dashed error bars indicate a sample size lower than 6 individuals. Quantifying inter- and intraspecific trait variation and the plasticity in leaf traits can help to understand plant species persistence to climate change. Our results suggest that leaf trait plasticity is an important mechanism for enabling plants to persist within communities and to better tolerate changing environmental conditions under climate change (Henn et al. 2018). My research thus illustrates how combining ecological, evolutionary and trait-based approaches allows disentangling community responses and effects on ecosystem function across broad biogeographical gradients, with potential for generalisation. Using large-scale gradient approaches to study interactive effects of global change drivers on biodiversity and ecosystem function. Multiple processes, such as dispersal limitation, population or evolutionary dynamics, interact to determine species range margins. Understanding the processes constraining species range margins thus underpins our ability to predict responses to climate change. For this, I use observational and experimental approaches along environmental gradients, which represent a space-for-time analogue of future climate conditions. For example elevational and latitudinal gradients provide ideal model systems to study species range limits, because they cover a similar range of climatic conditions, particularly of temperature, but differ greatly in other factors such as spatial scale (Figure 2a). In a field survey we found that species reach lower temperature limits along the elevational compared to the latitudinal gradient (Figure 2b, Halbritter et al. 2013). Different explanations could be responsible for this pattern and we performed a reciprocal transplant experiment to investigate local adaptation in populations of 2 Plantago species from central locations in their European range and from their latitudinal and elevational range edges (in northern Scandinavia and Swiss Alps, respectively). Range-centre plants of P. major were adapted to conditions at the range centre, but performed similarly to range-edge plants when grown at the range edges. There was no evidence for local adaptation when comparing central and edge populations of P. lanceolata. However, plants of both species from high elevation were locally adapted when compared with plants from high latitude, although the reverse was not true (Halbritter et al. 2015). Figure 2: (a) Conceptual figure of thedifference in steepness along elevational and latitudinal gradient, which has important implications for ecological and genetic processes affecting range margins, including dispersal and local adaptation. For example, gene flow is expected to be higher along the elevational gradient, which might have contrasting consequences for adaptation at these range margins. (b) Comparison of minimal growing degree days (GDD) along the elevational (minimal GDD elev) and latitudinal (minimal GDD lat) gradients for species that occurred at least five times along each gradient. The dashed line shows the line of equality (y = x). The black solid line shows the major axis (MA) regression line for all 155 species including the confidence interval (grey lines). Using replicated, large-scale experiments along environmental gradients, I demonstrate that species responses to climate change are highly context-dependent. For example, populations from elevational range edges, but not from high latitude range edges, are locally adapted (Halbritter et al. 2015). This is possibly due to higher genetic variation and gene flow at the elevational range edge, where the distance between populations is smaller. Through replicated experiments, my research thus allows better understanding of different ecological and evolutionary processes along environmental gradients, which can give insight to the underlying drivers of environmental change. Studying underlying mechanisms and large-scale patterns in global change ecology by synthesising across studies. Global change is a threat to biodiversity and ecosystem functioning and a better understanding of their impacts on ecosystems is urgently needed. Synthesising results across studies is a useful approach to explore large-scale patterns and context dependencies in effects and responses to global change. Towards this end, we produced “The handbook for standardised field and laboratory methods for terrestrial global-change experiments” (Halbritter et al. 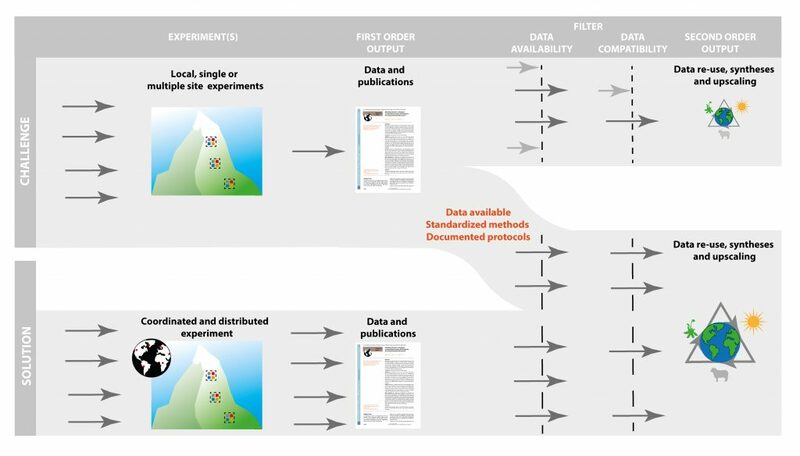 in review in Methods in Ecology and Evolution, preprint version) to overcome major challenges regarding data compatibility and facilitate important second-order output such as data re-use, syntheses, and upscaling. Further, we argue that good data management practice (e.g. reproducibility, data documentation, open data) is a key step to overcome the data availability challenges and thus optimise opportunities for syntheses. Funding bodies and publishers are increasingly recognising this, and now often ask for data management plans and FAIR open science practice. Towards this end, I participate in coordinating and developing research methods and practices across the ecological community through large scale collaborations and international networks (e.g. ClimMani and OpenTrait network, Gallagher et al. in prep). Figure 3: Challenges operating on the flow of knowledge from experimental methodology to the various resulting outputs that prevent synthesising data from experiments and the solution to use standardised methods and sampling protocols and/or coordinated and distributed experiments. Shown are first-order outputs (data and publications) and second-order outputs (data re-use, syntheses, upscaling). The challenges for the information flow from first-order outputs to second-order outputs are represented by data availability and data compatibility filters (dashed lines). One solution and the focus of this paper, is to use standardised sampling protocols and methods that increase the comparability of experiments and results across studies.